The thing is the UK does not have one housing market. Instead, it is a patchwork of mini property markets all performing in a different way. At one end of scale is Kensington and Chelsea, which has seen average prices drop in the last twelve months by 6.2% whilst in our East of England region, house prices are 14.3% higher. But what about Bedford? Property prices in Bedford are 13.8% higher than a year ago and 0.9% higher than last month. So what does this mean for Bedford landlords and homeowners? Not that much unless you are buying or selling in reality. Most sellers are buyers anyway, so if the one you are buying has gone up, yours has gone up. Everything is relative and what I would say is, if you look hard enough, there are even in this market, there are still some bargains to be had in Bedford. However, the most important question you should be asking though is not only is what happening to property prices, but exactly which price band is selling? I like to keep an eye on the property market in Bedford on a daily basis because it enables me to give the best advice and opinion on what (or not) to buy in Bedford. If you look at Bedford and split the property market into four equalled sized price bands. 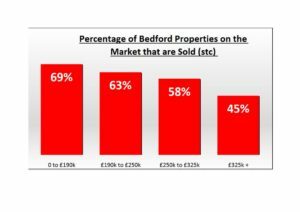 Each price band would have around 25% of the property in Bedford, from the lowest in value band (the bottom 25%) all the way through to the highest 25% band (in terms of value). Fascinating don’t you think that it is the lower Bedford market that is doing the best?